WEST SACRAMENTO, CA. 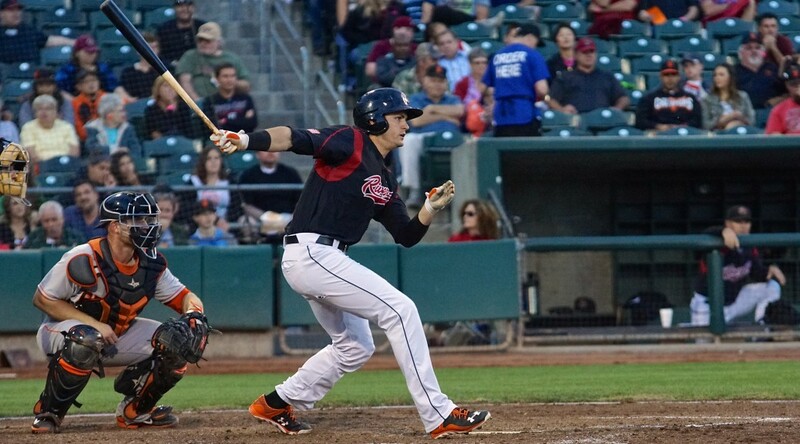 – The Sacramento River Cats picked up their sixth straight win in dramatic fashion Saturday night, kicking off their homestand with a 3-2 walk-off win in front of a sold-out crowd at Raley Field. Sacramento and the Round Rock Express traded zeros for seven innings before Trevor Brown broke the 2-2 tie with a walk-off single in the bottom of the 13th inning. With one down in the 13th, Darren Ford poked a single to centerfield. The hit was his third of the night, and the speedy outfielder reached base four times overall going 3-for-5 with a walk and a run scored. Ford stole second – his second stolen base of the night and 27th of the season – before Brown came to the plate. 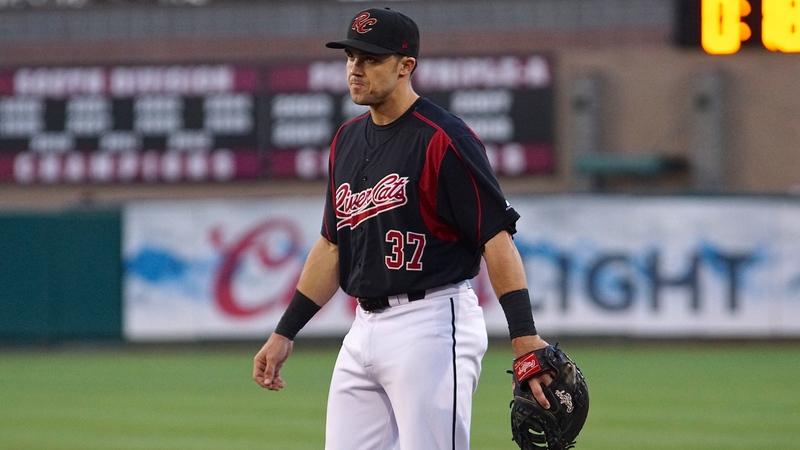 Brown entered the game in the top of the tenth, replacing the rehabbing Andrew Susac. 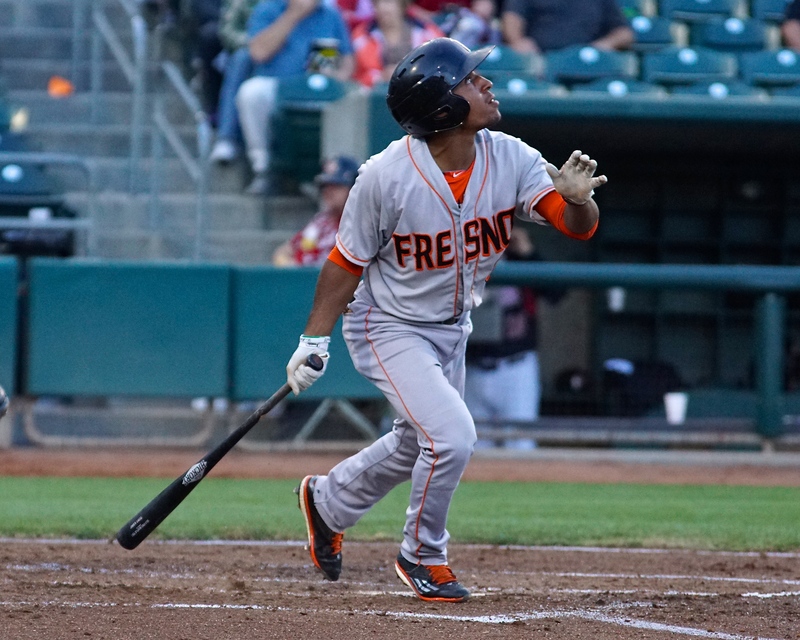 Brown lined an 0-1 pitch to right field as Ford raced home from second, scoring easily and giving Sacramento their eighth extra-inning win and seventh walk-off win of 2015. Susac, in Sacramento on a rehab assignment for a sprained right-thumb, was 0-for-4 with two strikeouts just one night after going 2-for-4 with a home run with the San Jose Giants (Advanced-A). Susac caught nine innings for Sacramento before being replaced by Brown in the 10th. Round Rock scored first, jumping ahead 1-0 in the fourth on a solo home run off the bat of outfielder Jared Hoying. The River Cats quickly countered, scoring twice on a Jarrett Parker RBI-double and a Kevin Frandsen RBI-single in the bottom half of the inning to take a 2-1 lead. Not to be outdone, Round Rock evened the score at two with a run-scoring single by Beamer Weems in the top of the fifth. The score stayed locked at two until Brown’s run-scoring single sent the River Cats home winners. Parker started his fifth straight game as the cleanup hitter for Sacramento and continued to have success in the role. Entering tonight’s game, the left-handed slugger was hitting .319 with two home runs, 10 RBI, and 15 stolen bases from the cleanup spot. With two more hits and an RBI, Parker is now hitting .327 (17-for-52) as the number four hitter. While the River Cats bullpen as a whole was superb, the group was headlined by right-hander Cody Hall. Hall threw three shutout innings, scattering three hits and striking out two. Most impressively, Hall needed just 32 pitches, 26 of which were strikes, to record nine outs. Brett Bochy picked up the win, his fourth of the season. Game two of the series will get underway tomorrow evening right back at Raley Field. Left-hander Nik Turley (5-6, 5.02) will take the mound for Sacramento as they look to push their win streak to seven. The Round Rock Express have yet to announce a starter. First pitch is set for 5:05 p.m., the first Sunday home five o’clock start of the season. The game can be heard live online at rivercats.com and on the air on ESPN 1320. FRESNO, Calif. – Looking to even up the? series with the Fresno Grizzlies, the Sacramento River Cats battled but came out on the wrong end of a 7-4 summer’s evening contest. Sacramento made things interesting with a rally in the middle innings, but the surge wasn’t enough to give Ty Blach the run support necessary to earn his 10th win of the year. Left-hander Blach (9-10, 4.51) did not look sharp out of the gates, as Fresno tagged him for three runs in the opening frame. He would settle down afterwards to give his offense a chance, but a 2-run homer from Matt Duffy in the sixth was too much to overcome. Blach finished the night allowing 6 runs on 9 hits, walking 1 and striking out 3 over 5 innings of work. 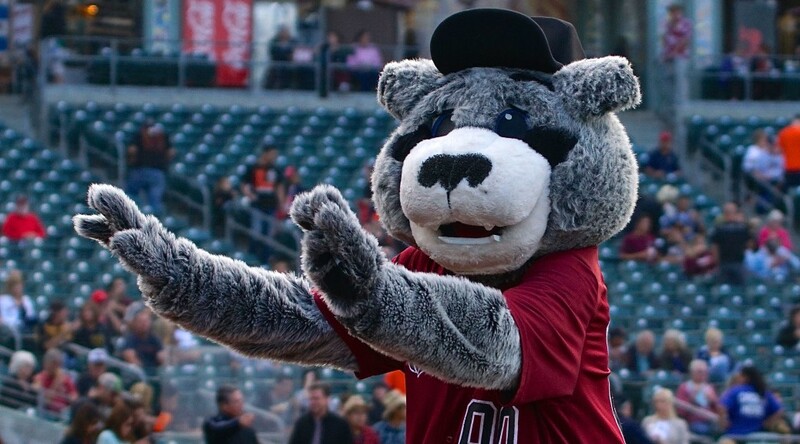 Trailing 4-1 entering the fourth inning, the River Cats had a chance to rest and regroup following a delay due to home plate umpire Spencer Flynn needing medical attention after taking a foul ball taken off the mask earlier in the game. Once play resumed, back-to-back singles set up an RBI single for Skyler Stromsmoe, cutting the deficit in half. Stromsmoe finished the night 2-for-4 with an RBI and a run scored. In the fifth, Sacramento threatened with a two-out rally. After a walk from Jarrett Parker, Ben Turner singled to right field to drive him in. Two batters later, Darren Ford line a ball into the gap in left-center field driving in Turner and trying the game. Tuner finished the game 3-for-4 with an RBI and 2 runs scored, and is now batting .386 (10-for-26) on the road in Triple-A this season. The game did not stay tied long as Duffy hit a 2-run homer with nobody out in the bottom half. The top of the order cooled off for Sacramento Thursday night. The first five spots in the order (Everth Cabrera, Ryan Lollis, Kevin Frandsen, Mac Williamson, and Parker) combined to go 0-for-21. Grizzlies’ starting pitcher Mark Appel (1-2, 4.62) took a no decision after lasting just 4.2 innings. The 2013 first overall pick of the Houston Astros allowed 4 runs (3 earned) on 6 hits, walking 3 and striking out 4. The win went to RHP Jordan Jankowski (6-3, 3.91) after throwing 2.1 innings of scoreless relief. The River Cats bullpen put in another strong night, as they combined for 3 solid innings of work. Steven Okert pitched a perfect sixth inning, striking out 2 in the process. Cody Hall put in 2 innings of work, allowing 1 run on 2 hits, walking 1 and striking out 3. Fresno did not look like their usual selves Thursday, as for one night only they changed their names to the Fresno Tacos. With around 50 Taco Trucks at Chukchansi Stadium, Fresno donned white and green uniforms with a bright orange taco logo on the cap. Things will get back to normal on Friday as the River Cats once again take on the Grizzlies for game three of this four game set. For Sacramento, it will be right-hander Chris Stratton (2-3, 3.56). Stratton is coming off back-to-back wins in his last two starts. For Fresno, LHP Brett Oberholtzer (4-3, 4.89) will take the mound. Game time is set for 7:05 p.m. and can be heard live on rivercats.com and ESPN 1320. 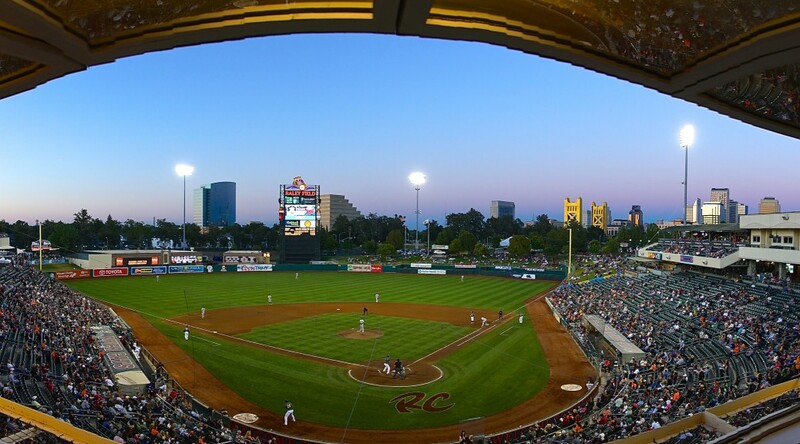 TACOMA, Wash. – Looking to keep a perfect post All-Star Game record, the Sacramento River Cats sent the game to extra innings for the second straight night, but couldn’t get the same decision in a 6-5 10 inning loss. Jarrett Parker hit his 14th home run of the season, but late fielding mishaps put Sacramento in a position they could not overcome. After putting up 2 runs in the first 3 innings, the River Cats finally faced some danger as Tacoma scored 5 runs in the middle innings to take a 5-2 lead. Sacramento did not sit idly by however, as in the sixth Parker cut the deficit to one with a 2-run homer, his 14th of the year. In the eighth, trailing by one, the River Cats started off the inning with back-to-back hits to put runners on the corners with no outs. The late rally resulted in just one run, coming off a Kevin Frandsen RBI double, but it was good enough to send the River Cats to their 13th extra inning contest of the season. In the bottom of the tenth, with the game tied, the glove became the River Cats biggest enemies as back-to-back errors put two on with no outs. With one gone, a sacrifice fly drove in the winning run to hand the River Cats their 6th extra-inning loss of the season. Tommy Hanson got the start Saturday and once again did not have his best stuff. He lasted just 5 innings and allowed 5 runs on 7 hits, walking 1 and striking out 3. 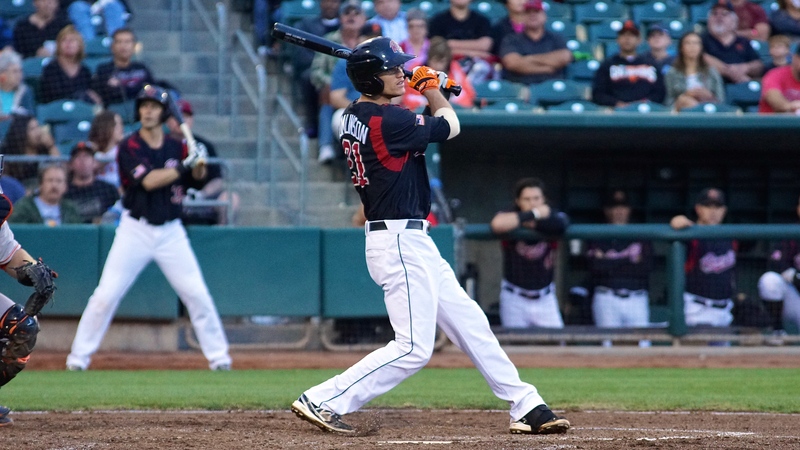 The start was the first time since joining the River Cats on July 7 that Hanson made it into the fifth inning. Former runner up for the American League Cy Young award, Chien-Ming Wang got the start for Tacoma. Wang took a no decision after pitching 7+ innings and allowing 5 runs (4 earned) on 11 hits with no walks and 1 strikeout. Three-time World Series Champion Jeremy Affeldt made his second rehab appearance on Saturday for the River Cats. Affeldt again looked good as he allowed just one base runner (via error) in 2 scoreless innings. Cody Hall took the loss after allowing the unearned run in the 10th. Sacramento will go for the series victory tomorrow as they send 22-year-old left-hander Clayton Blackburn (3-3, 4.07) to the mound. The young righty is coming off of his first winning start since rejoining the starting staff after a stint in the bullpen due to the rehab assignments of Matt Cain and Jake Peavy. Opposing him for the Rainiers will be lefty James Gilheeney (1-0, 3.38). First pitch of the series finale is set for 1:35 p.m.
WEST SACRAMENTO, CA. 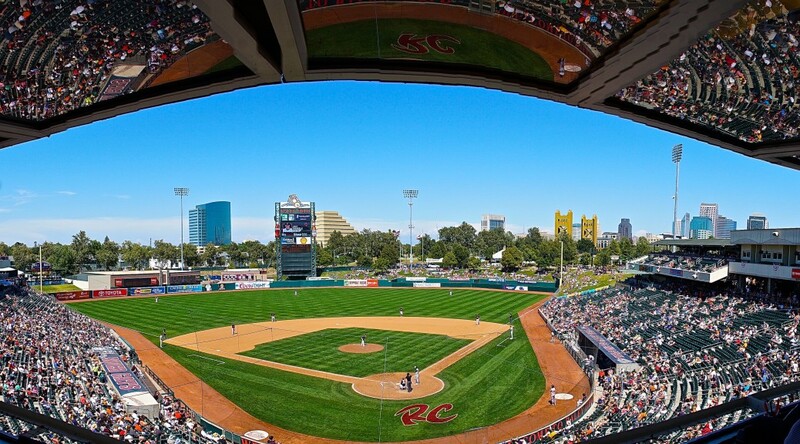 – The Sacramento River Cats closed out the first half of the season this afternoon with a 5-3 loss to the rival Fresno Grizzlies at Raley Field. 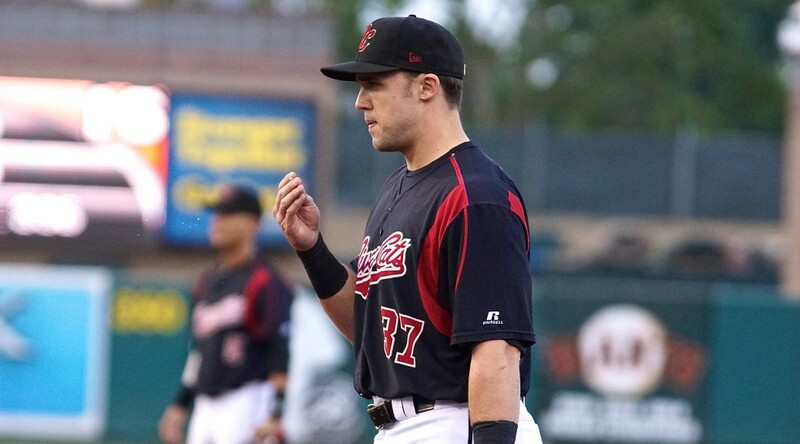 Adam Duvall ended his first half on a high note as he prepares to head to the 2015 Triple-A All-Star Game in Omaha this week. Duvall followed up on his record-tying three-homer night with a solid 2-for-4 afternoon. The first baseman hit his 21st double of the season, which is tops on the River Cats and tied for 13th in the PCL. Overall, Duvall has 43 extra-base hits, third most in the league. The 2015 All-Star closed out the first half hitting .467 (7-for-15) in his last four games with 4 home runs and 7 RBIs. Since the start of July, Duvall is hitting .353 (18-for-51) with 4 homers, 4 doubles, 11 RBIs, and 10 runs scored. 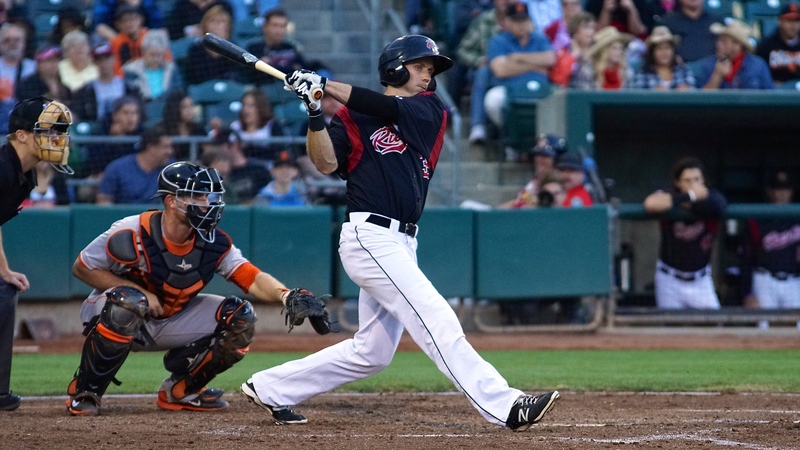 Kelby Tomlinson, Kevin Frandsen, and Guillermo Quiroz each drove in a run for the River Cats. Frandsen is also taking a hot streak into the break. The infielder is hitting .500 (6-for-12) with a double, triple, and 5 RBIs in his last five games. On the opposite side of the ball, River Cats’ starter Tommy Hanson never quite had it Sunday afternoon. The right-hander lasted just 3.2 innings while throwing 103 pitches (59 strikes). He did keep the River Cats in the game, though, giving up 3 runs on 5 hits and 4 walks while striking out 6. Cody Hall, Mike Broadway, and Erik Cordier combined for 5.1 innings of relief out of the River Cats’ bullpen. The trio, who have an average fastball velocity of 96 mph, allowed 2 runs (1 earned) while scattering 5 hits and 4 walks with 6 strikeouts. Broadway lowered his already excellent ERA to 1.10 and struck out 3, increasing his K:BB ratio to an impressive 43:8 in 32.2 innings. 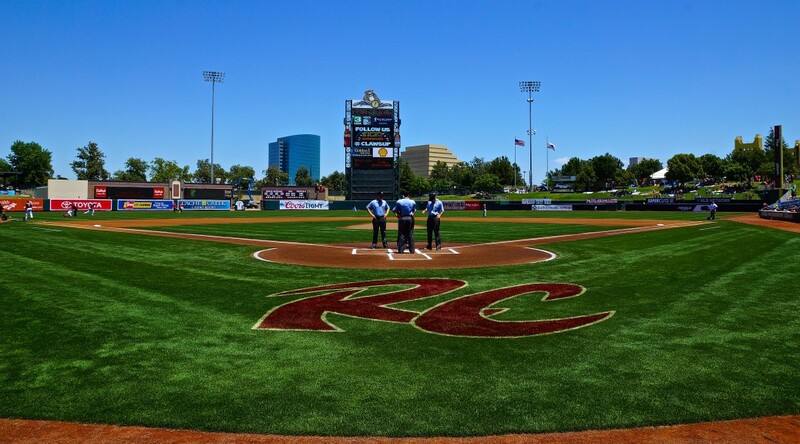 The River Cats are off until Thursday, July 16, when they’ll head north to take on the Tacoma Rainiers. 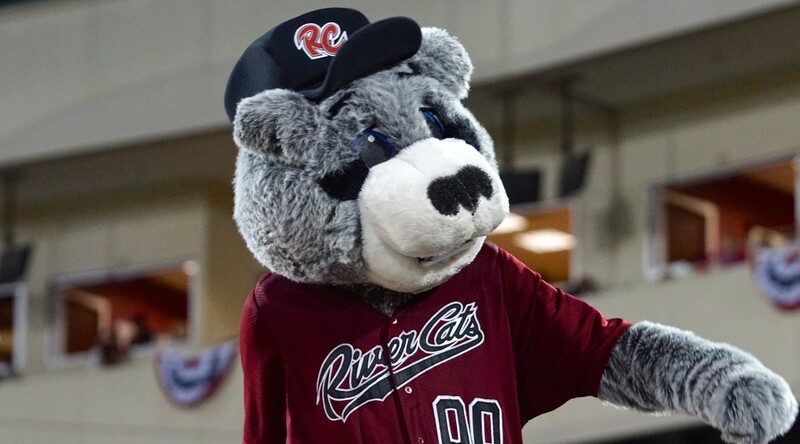 The River Cats are 4-4 against Tacoma this season and will face the Rainiers for the first time this season at Cheney Stadium in the Evergreen State. First pitch Thursday is set for 7:05 p.m.
Before then, the Triple-A All Star Break kicks off tomorrow, Monday, July 13 with the Home Run Derby. An off-day on Tuesday will be followed by Wednesday’s All-Star Game. The derby starts at 5:35 p.m. (PT) and the All-Star Game gets underway Wednesday at 5:05 p.m. (PT).